CCTA bus driver Rob Slingerland speak during Church Street press conference. Bus drivers from the Chittenden County Transportation Authority are accusing the agency of ignoring their concerns about safety and work hours during ongoing contract negotiations, and say they are willing to go on strike if an agreement is not reached soon. 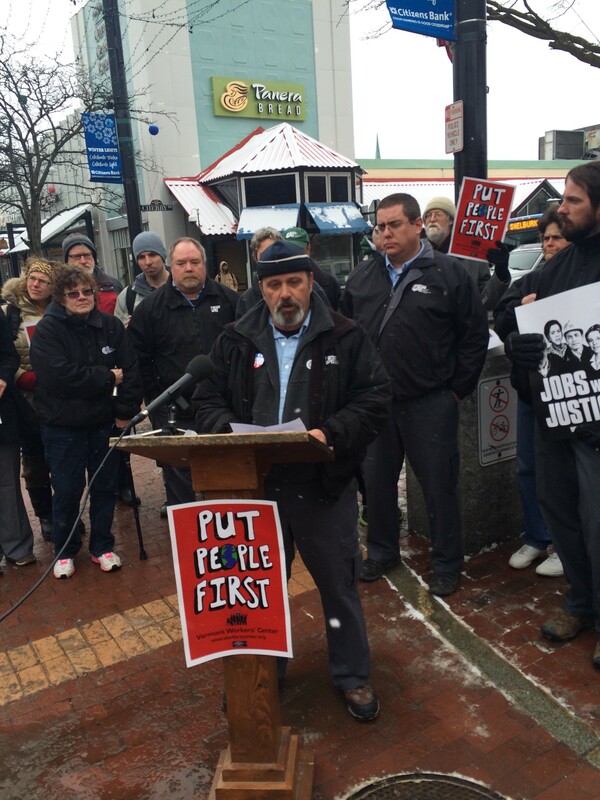 Drivers, along with supporters from the Vermont Worker’s Center and other groups, gathered on Church Street near a bus stop, and aired their grievances against CCTA as they prepare for a negotiating session on Friday. The union rejected CCTA’s most recent offer in late January by a 53-4 vote and drivers have been operating without an agreement since a three-year pact expired in June. The drivers’ focus is not on pay and benefits. Rather, drivers say they are primarily concerned about working long hours during split shifts, which they say could make them tired and put them at increased risk of accidents. They also say they are worried that a CCTA push to use more part-time drivers may eventually threaten jobs. “We are determined to protect our union and continue providing transportation that our public and our union deserve,” Slingerland said. CCTA spokeswoman Meredith Birkett did not respond to a request for comment after the union event. But in statements released in recent days, CCTA officials said the offer rejected by the union was essentially crafted by an independent fact-finder. Bus drivers have received annual raises, even through the recent economic slump, and have enjoyed health, dental and vision benefits, CCTA says. The new contract would have provided raises and continued a strong benefits package, the agency said. “CCTA has historically set a high bar to attract and retain our highly skilled drivers and CCTA’s proposals seek to build upon that history,” CCTA general manager Bill Watterson said in a prepared statement. CCTA said it made two offers to the union — the factfinder’s proposal, and a slightly more generous deal. The union chose not to vote on the factfinder’s deal before rejecting the other proposal. The union says it wants tweaks to drivers' schedules and enhanced work regulations to improve safety. Slingerland said drivers are particularly concerned that CCTA wants to incease the "spread time" — the window in which drivers are forced to work split shifts — from 12 hours to 15 hours. For example, Slingerland said he often works from 7 a.m. to 9 a.m., and again from 2 p.m. to 7 p.m. CCTA, he said, might force that window to be increased by several more hours, potentially taking drivers away from their families more and making them more fatigued. CCTA often forces drivers to pick up extra hours (for which they are paid), the union said. Bus drivers also say CCTA has made it more difficult for them to take bathroom breaks. The union and management are scheduled to meet on Friday and hear the latest proposal from a mediator, Slingerland said. The union also has a proposal of its own it will offer if it finds the mediator’s plan wanting. Representatives from unions representing the University of Vermont faculty and local healthcare workers also joined the press conference. CCTA offers fixed and commuter routes throughout the county and is governed by a board that includes representatives from Burlington, Winooski, Essex, Hinesburg, Shelburne, Milton, Williston and South Burlington. It had about 2.7 million riders in 2012.